Ms. Johnson is a native of Macon, Georgia. 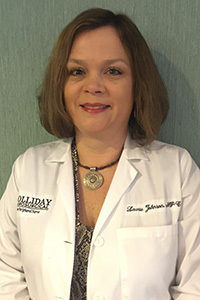 She has worked in middle Georgia healthcare for 30 years, and completed her national board certification for Family Nurse Practitioner in 2003. She has worked in Neurosurgery, Oncology, Hematology, Critical care, and Invasive Cardiology/Radiology. Laurie joined our practice in 2013. She has worked as a registered nurse in ICU, PACU, interventional radiology, and cardiac cath lab. She obtained her Nurse Practitioner licensure and Family Nurse Practitioner Certification in 2003, and has been working as a certified nurse practitioner for the past 13 years.